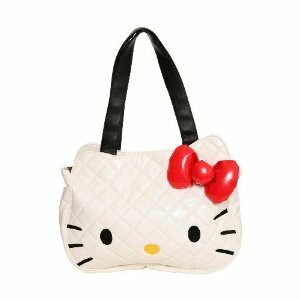 If you love Hello Kitty, then chances are you will love this fun little shoulder bag. Personally, I can never make up my mind about a bag like this. On the one hand it is a fun little creation, perfect for those who love to put a bit of kitsch tongue-in-cheek fun into their outfits. I know many people who could wear this quilted tote with Harajuku inspired style, and who would look damn good whilst doing it. On the other hand, however, this is a giant Hello Kitty head with handles. And that, in itself, is bound to be a little bit odd. It certainly isn't suitable for work, and whilst it is fun-loving it also hovers uneasily on the boundary between fun and just plain silly. Practically, this bag has a few issues. Sure it is nice inside and it certainly has room, but what is with those somewhat over-sized black handles?! To me they don't tie in with the theme, and I think they are what is putting me off this affordable handbag most of all. This is a good laugh, and I bet there are people out there who can make it look very cool indeed. Unfortunately those people don't include me! The Hello Kitty embossed bowler, a great alternative to this cartoon bag.